includes (VAV) all-weather floor mats, LPO and (VBR) rubber bed mat, LPO, (dealer-installed) (Requires (B30) color-keyed carpeting. Not available with (CGN) spray-on bed liner or (VZX) bed liner, LPO.) 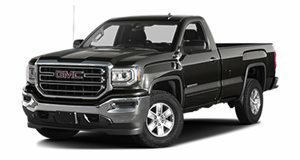 GMC Interior Protection Package Includes the following options:All-weather floor mats Rubber bed mat Requires available color-keyed carpeting. includes (VAV) all-weather floor mats, LPO and (VBR) rubber bed mat, LPO, (dealer-installed) (Not available with (CGN) spray-on bed liner, (PDL) Cargo Convenience Package, LPO or (VZX) bed liner, LPO.) GMC Interior Protection Package Includes the following options:All-weather floor mats Rubber bed mat Requires available color-keyed carpeting. requires 4WD models, includes Z71 chrome side front fender emblems, monotube Rancho brand shocks and (K47) air cleaner, (JHD) Hill Descent Control, (NZZ) underbody shield (Included with (GAT) All Terrain Package. Not available with (QSS) P275/55R20 all-season, blackwall tires or (RKX) P265/65R18 all-season blackwall tires. Requires all-terrain tires.) Off-Road Suspension Package This available option includes the following features:46mm high-pressure gas-charged shocks A 34mm front stabilizer bar Under body transfer case shield helps protect the transfer case from rocks and debris High-capacity air cleaner Z71 chrome side emblems Hill descent control Requires available all-terrain tires Included with available All Terrain Package. Available with 20" or 22" wheels. requires 4WD models, includes Z71 chrome side front fender emblems, monotube Rancho brand shocks and (K47) air cleaner, (JHD) Hill Descent Control, (NZZ) underbody shield (Includes (UHN) 18" x 8.5" (45.7 cm x 21.6 cm) bright machined aluminum wheels. Not available with (RBZ) P255/70R17 all-season, blackwall tires or (QSS) P275/55R20 all-season, blackwall tires. Requires all-terrain tires.) Off-Road Suspension Package This available option includes the following features:46mm high-pressure gas-charged shocks A 34mm front stabilizer bar Under body transfer case shield helps protect the transfer case from rocks and debris High-capacity air cleaner Z71 chrome side emblems Hill descent control Requires available all-terrain tires Included with available All Terrain Package. Available with 20" or 22" wheels. includes 9.76" rear axle, 8-speed transmission with 3.42 or 6- speed transmission with 3.73, (JL1) trailer brake controller, enhanced cooling radiator, revised shock tuning for increased control, heavier duty rear springs and increased RGAWR (Requires (RKX) 18" tires or may upgrade to (RD5) 20" chrome wheels with either (RC7) or (QSS) 20" tires. With (L86) 6.2L engine, requires (RD5) 20" wheels with (QSS) 20" tires. Requires (DQS) power adjustable, power folding camper mirrors. Not available with (GAT) All Terrain Package and (Z71) Off-Road Suspension Package.) Max Trailering Package Available on select SLE and SLT models, this package extends Sierra max trailer ratings.1 It includes:Increased towing and GCWR rating Automatic locking rear differential Handling/Trailering Suspension Package Enhanced cooling radiator Revised shock tuning Heavier duty rear springs and increased RGAWR 9.76" rear axle Trailer brake controller Trailering Equipment Requires 5.3L EcoTec3 V8 engine or 6.2L EcoTec3 V8 engine and power camper mirrors. Not available with Z71® Off-Road Suspension Package or All Terrain Package. includes (UHX) Lane Keep Assist, (TQ5) IntelliBeam headlamps, (UHY) Low Speed Collision Mitigation Braking, (UD5) Front and Rear Park Assist and (UEU) Forward Collision Alert, Safety Alert Seat (Included with (PDT) SLT Crew Cab Premium Plus Package. Requires Crew Cab or Double Cab model. Requires (PCM) SLT Preferred Package, (KQV) heated and ventilated driver and front passenger seating, (AN3) front bucket seats and (H3A), (H3B) or (H3C) interior trim. Not available with (GAT) All-Terrain Package.) Enhanced Driver Alert Package Includes: Lane Keep Assist IntelliBeam headlamps Low Speed Forward Automatic Braking Front and Rear Park Assist Forward Collision Alert Safety Alert Seat This package requires heated and vented driver and front passenger seating, front bucket seats and perforated leather-appointed seat trim on Crew Cab and Double Cab models Regular Cab requires available 40/20/40 split-bench seats, Jet Black Cloth interior trim, SLE Convenience Package and 5.3L EcoTec3 V8 engine. includes (UHX) Lane Keep Assist, (TQ5) IntelliBeam headlamps, (UHY) Low Speed Collision Mitigation Braking, (UD5) Front and Rear Park Assist and (UEU) Forward Collision Alert, Safety Alert Seat (Requires Regular Cab model. Requires (AG1) driver 10-way power seat-adjuster, (AZ3) seats 40/20/40 split-bench with (H0U) Jet Black cloth interior trim, (PCY) SLE Fleet Preferred Package, (L83) 5.3L EcoTec3 V8 engine and (N37) manual tilt and telescopic steering column.) Enhanced Driver Alert Package Includes: Lane Keep Assist IntelliBeam headlamps Low Speed Forward Automatic Braking Front and Rear Park Assist Forward Collision Alert Safety Alert Seat This package requires heated and vented driver and front passenger seating, front bucket seats and perforated leather-appointed seat trim on Crew Cab and Double Cab models Regular Cab requires available 40/20/40 split-bench seats, Jet Black Cloth interior trim, SLE Convenience Package and 5.3L EcoTec3 V8 engine. includes 9.76" rear axle, 8-speed transmission with 3.42 or 6- speed transmission with 3.73, (JL1) trailer brake controller, enhanced cooling radiator, revised shock tuning for increased control, heavier duty rear springs and increased RGAWR (Requires Crew Cab or Double Cab models. Includes (G80) heavy-duty automatic locking rear differential on 2WD models (already standard on 4WD models) and Z82 Trailering Package. Requires (L83) 5.3L EcoTec3 V8 engine and (DPN) power camper mirrors. Not available with (SXL) Elevation Edition, (Z71) Off-Road Suspension Package. Includes (UHN) 18" X 8.5" bright-machined aluminum wheels. Requires (RKX) 18" tires or may upgrade to (RD3) 20" bright machined aluminum wheels with either (RC7) or (QSS) 20" tires.) Max Trailering Package Available on select SLE and SLT models, this package extends Sierra max trailer ratings.1 It includes:Increased towing and GCWR rating Automatic locking rear differential Handling/Trailering Suspension Package Enhanced cooling radiator Revised shock tuning Heavier duty rear springs and increased RGAWR 9.76" rear axle Trailer brake controller Trailering Equipment Requires 5.3L EcoTec3 V8 engine or 6.2L EcoTec3 V8 engine and power camper mirrors. Not available with Z71® Off-Road Suspension Package or All Terrain Package. includes (CGN) spray-on bed liner, (UHN) 18" x 8.5" (45.7 cm x 21.6 cm) bright machined aluminum wheels, (AN3) front bucket seats and (UQA) Bose premium audio system, (DP6) Black painted mirror caps, (D75) body color door handles, (B86) body color side molding, Black belt molding, (Z71) Off-Road Suspension Package with monotube Rancho shocks, (NZZ) underbody shield, (UD7) Rear Park Assist, (RIA) floor liners, LPO deletes the standard (B58) carpeted floor mats, (VB5) front body-color bumper, (VT5) rear body-color bumper with corner steps, unique grille with body color surround and chrome accents, bright sill plates and All-Terrain cluster. All Terrain side emblem replaces Z71 fender emblem and Sierra door emblem. Requires one of the following exterior colors: (G1K) Stone Blue Metallic, (GAZ) Summit White, (GBA) Onyx Black, (GPA) Dark Slate Metallic, (GMU) Pepperdust Metallic or (G1E) Crimson Red Tintcoat (Requires 4WD models, (H2W) interior trim jet Black/Spice Red, (RBX) P265/65R18 all-terrain, blackwall tires or (RBW) P265/65R18 all-terrain, white outlined tires with (UHN) 18" x 8.5" (45.7 cm x 21.6 cm) bright machined aluminum wheels. Not available with SEO options, (NHT) Max Trailering Package, (PDT) SLT Crew Cab Premium Plus Package , (PDB) SLT Premium Package, (PDC) Texas SLT Premium Package, (Y86) Enhanced Driver Alert Package and (VQY) Chrome recovery hooks, LPO. Upgradeable to (NZH) 20" wheels with (RC7) 20" tires or LPO 20" and 22" tires and wheels.) All Terrain Package Includes: Z71 Off-Road Suspension Package including under body shield and high capacity air cleaner White with Red letters Rancho® Tenneco brand shocks Front and rear body-color bumpers with CornerSteps Body-color exterior door handles and bodyside moldings Black painted exterior rearview mirrors All Terrain front grille with body color grille surround Rear park assist Spray-on bed liner 18" bright machined aluminum wheels (Upgradeable to 20" or 22" wheels and tires) All Terrain exterior emblems Front full feature power, heated, bucket seats with jet black leather-appointed trim and spice red accents Interior floor liners Bright sill plates Bose® premium sounds system Requires SLT Double Cab 4WD or SLT Crew Cab 4WD models Sierra 4WD models include Eaton® automatic locking rear differential for off-road control Requires one of the following exterior colors: Stone Blue Metallic, Summit White, Onyx Black, Dark Slate Metallic, Pepperdust Metallic or Crimson Red Tintcoat. P265/65R18 all-terrain blackwall tires can be upgraded to P265/65R18 on-/off-road White-outlined letter tires.